A Disgruntled Republican in Nashville: Nashville, I call on you to Save The Fairgrounds Again !!!! Nashville, I call on you to Save The Fairgrounds Again !!!! 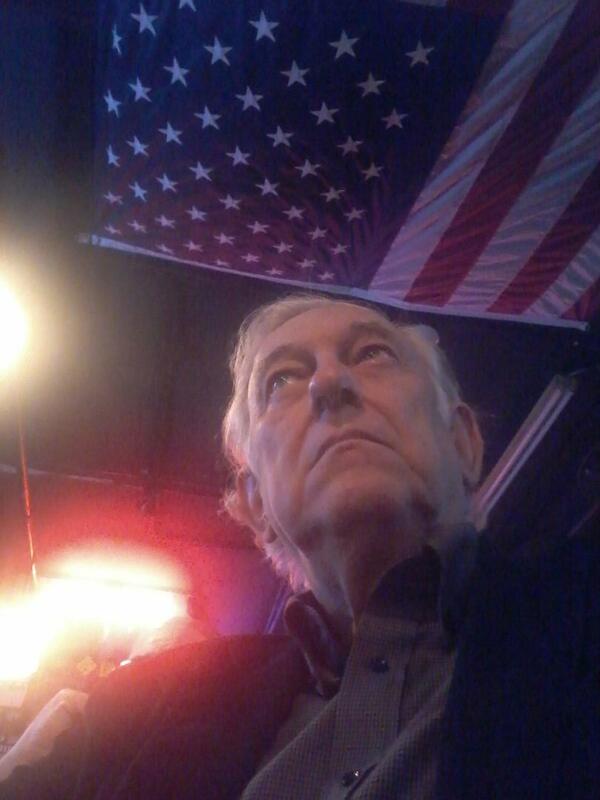 by Tony Tenpenny, from a Facebook post dated 5-30-2018 - This is my public response to last night’s meeting : As Chairman of the Board of Save Our Fairgrounds I must respond to this continuing give away of public land to a billionaire to build a soccer stadium and an additional 10 Acres of PUBLIC LAND to the same billionaire and his development partners to build commercial, retail, and residential buildings and then pocket the profits. This is a disgrace to the citizens of Nashville and flies in the face of what the citizens voted to do in 2011 by a 72% margin. That vote changed the charter of Metropolitan Nashville Government and forces Metro to get 27 votes to change the 3 major uses on this property. Please note on this new plan there is NO PLACE FOR A STATE FAIR. The City of Nashville and all of the citizens here should be embarrassed that we are not honoring the original reason Nashville owns this property now. Over 100 years ago a then wealthy family of Nashville donated the 117 Acres of current Fairgrounds Property to the State of Tennessee and Davidson County Government to insure ONE THING: that Nashville, Tennessee would ALWAYS host the Tennessee State Fair. PERIOD. Just one simple request for ALL of this land. Nashville’s leaders again are pushing ahead with their plans and not honoring a request from this family. Look at these plans, No where on this map is there a place designated for a Tennessee State Fair!!!!!! I call on the press to ask John Ingram if he had a choice on where the stadium would be built in Nashville ?? He has told more than one person that I personally know he was told by Rich Rebling and Megan Barry that the soccer stadium had to go on the Fairgrounds property. This is the same kind of plan Rich Rebling has had for the property since he convinced Mayor Karl Dean to announce the closing of the Fairgrounds in 2010. We know how that turned out. The citizens rose up and passed the Amendment to the Charter by 72% of the voters in 2011 choosing to prevent this very kind of thing from happening. So Nashville, I call on you to Save The Fairgrounds Again !!!! Go to Save Our Fairgrounds Facebook page for updates. by Rod Williams - The fairgrounds originally opened in 1891 as a horse racing track named Cumberland Park. The park became the home of the Tennessee State Fair in 1906 and was purchased by the Davidson County government in 1910. That the fairgrounds was "purchased" by Davidson County is what Wikipedia reports but I have had an understanding that some wealthy Nashvillians gave the property to Davidson County with the understanding that it always be used as a fairgrounds or revert to the families that gave it to the County in the first place. I don't know the facts. If anyone can explain this discrepancy, please do so. an impressive one. The Tennessee Valley A & I fair in Knoxville is bigger and the Wilson County fair is bigger. Since 1969 the fairgrounds has been home to the monthly Nashville Flea Market, one of the largest such events in the southeast. It features 1,500 booths of antiques, collectibles, furniture, glass, jewelry, and fine art with dealers from 30 states. As flea markets go, it is impressive. The fairgrounds is also home to the Fairgrounds Speedway which is the oldest continually operating track in the United States. The track held NASCAR Grand National/Winston Cup races from 1958 to 1984. 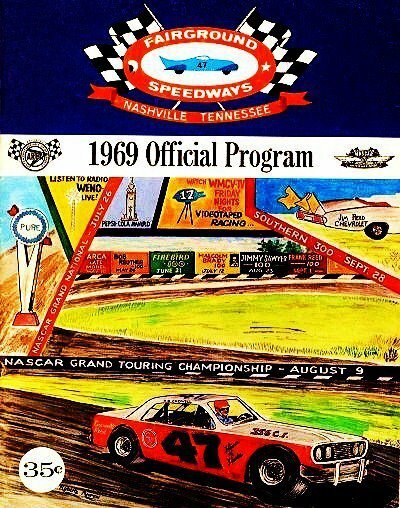 Many greats of stock car racing got their start at the Nashville Speedway such as Darrel Waltrip and a bunch of others. 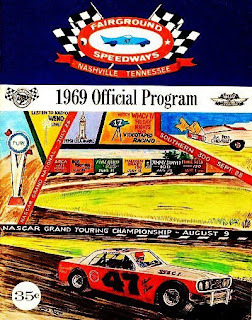 In addition to famous stock car racers calling the Nashville Speedway home, famous country musc star Marty Robbins raced there. In 2009, Mayor Karl Dean announced the Metro government's intention to redevelop the fairgrounds into a mixed-use neighborhood, displacing the state fair. Opposition to the closure prompted a countywide referendum in August 2011 that amended the Metro charter to require the continued existing activities at the fairgrounds site. The amendment was passed by over 70 percent of voters. In 2016, mayor Megan Barry proposed demolishing several buildings on the fairgrounds to make way for community parks and soccer fields. The plan, which also includes a new soccer stadium for the new Nashville MLS team, would displace the fair by 2019. This is the briefest of summaries. There has also been issues of the conflicts and relationship between the state fair commission which is charged with putting on a state fair and the Metro Nashville fair board which administers the fairgrounds. There has also been issues of funding subsidies for the fairgrounds, the banning of a popular gun and knife show which was a major tenant of the fairgrounds, the future of the racetrack, a consultants study which advised the city on the future of the fairgrounds, and spending of money on the development of the soccer stadium when that funding had not yet been appropriated by the Council. The status and future of the fairgrounds has been a long complicated contentious issue ever since Mayor Dean proposed doing away with it. Where we are now is that the in November 2017, the Metro Council approved $225 million in revenue bonds to develop a Major League Soccer stadium to be developed on the fairground site. In December Nashville was awarded a MLS franchise. As part of a deal with the developers of he soccer stadium, the city gave ten acres of prime fairgrounds property to the private developer of the soccer stadium. Despite approval of the bonds the soccer deal is not a done deal yet. The council must still actually approve the issuance of the bonds. Also, the ten acres of mixed use development will require council action to rezone the property. Also, demolition of current buildings at the fairgrounds will require council action.The developers of the soccer stadium say that without that ten acres the soccer deal will not work. Recently there was an attempt to approve the issuance of the bonds without those bonds tying the stadium to the fairgrounds location. That effort appears to have failed. There has been a move to have the soccer stadium be located in Metro Center rather than the fairgrounds. Developers say the soccer deal is dead if the soccer stadium is located anywhere other than the fairgrounds. What has developed most recently is that the Fair Board presented a new master plan for the fairgrounds. This plan moves the ten acres that is to be given to the developers of the soccer stadium from one location to another location. Critics of this plan say the new master plan leaves no place for there to actually be a fair at the fairgrounds. There has been a long hard fight to save the fairgrounds. Leaders of the effort have included council members Tony Tenpenny, Duane Dominy, and Robert Duvall and citizen leaders like Rick Williams and Milissa Simpson and others whose names I do not immediately recall and hundreds of citizens who worked to get the charter amendment passed which we thought would save the fairgrounds. While the leaders of the effort to save the fairgrounds are mostly Republicans, I do not see this as a Republican-Democrat issue but more of a conflict between the elite and the common man. My perception is that there is an element of insiders, upper crust elites, and new comers to Nashville who are embarrassed by Nashville's southern, country, and rural identity. In their vision of the "it" city, there is no room for gun and knife shows, stock car racing, flea markets or fairs. In the last twenty years or so, city elites have embraced Nashville's identity as "Music City" since that now includes more than just county music and since country music is now cool and since that put Nashville on the map, but twenty years ago they did not want Nashville to be know for that old hillbilly music; they wanted Nashville to be "the Athens of the South." That elitist mentality is still prominent in our city. In there view, there is not much room for original Nashvillians in the new Nashville. In there heart I think they want Nashville to be "the San Francisco of the South." The fight is not over. Those who want to wipe the fairgrounds off the map have not won yet. Please stay informed and involved. For the Tennessean's coverage of the latest fairground's controversy, follow this link. Who is running for the office of Vice Mayor? Why is Metro short of money? Briley wins big. No runoff. Early voting in the mayor's race starts today!